Happy Monday! I hope you had a lovely weekend, or are still enjoying a long weekend for those who celebrate Labor Day. 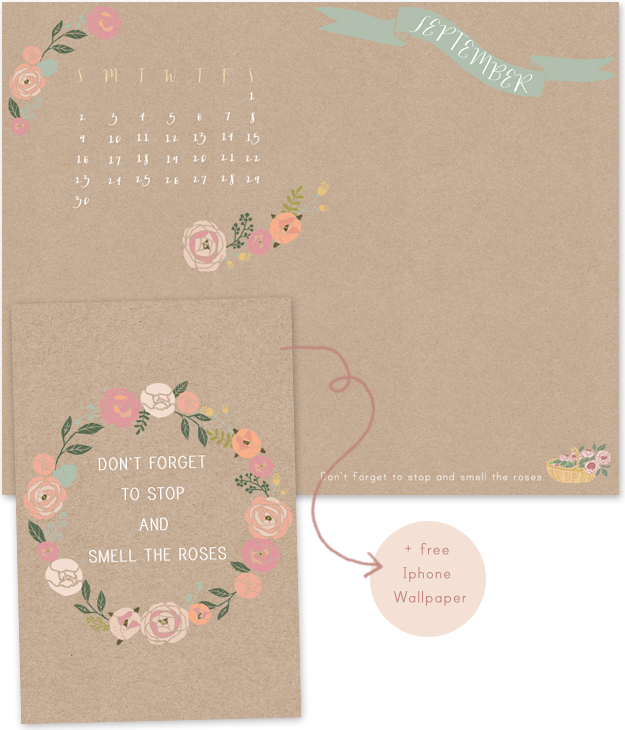 To celebrate the beginning of a new month, I have a little freebie for you! There are a lot of pretty desktop calendars out there, and I usually use some that I find around the blogosphere, but sometimes I just don't find what I'm looking for and I create one for myself. I certainly don't think that mine are better than others (definitely not! ), they're just a better fit for my current mood or current color crush. I thought I could share them here from now on, in case some of you are interested. And I made a matching Iphone wallpaper too, just to add to the fun! I used cliparts from my lovely sponsor The Ink Nest, who has the loveliest hand drawn cliparts! I would love to hear your thoughts! Are desktop calendars something you're interested in? Would you like to have a new one posted here every new month? I would be so grateful to have your feedback. Thanks for sharing! I would definitely like a desktop to download each month. I love having something pretty on my screen! Thanks, just set it on my computer! I absolutely love it! I've been obsessed with craft paper lately and you've used my favorite colors. Completely perfect. Thanks! Very nice. Thank you very much. Get it right now. They are very cute! I love the colors. Thanks! This is great! Thanks for sharing this. I've set it as my desktop background and I would love if you would keep doing it. I usually like the style of things that you post, so I'm sure I would get some use out of future desktop backgrounds. The calendar is really practical, too (not to mention the reminder to enjoy the simple things)! I agree with everyone else, these are great! And you're so kind to share them with us! The colors + flowers + fonts are a lovely combination. I really love the iPhone wallpaper, too! Thanks for sharing! The desktop calendar is so cute and perfect! So beautiful! They remind me so much of all your stuff...love it! Great idea! I'll do that for the following wallpapers, but for this one, what size do you need? Question, I was wondering if it would be okay to print out the Iphone wallpaper and frame it for my wall? I really like it! Sure, but as it was designed for iPhone (320 x 480px), you would have to print it in that size (super small!) or it will be all pixillated. Thanks for asking!